42 sheep were found dead from apparent animal bites on a farm in Honduras that was guarded by dogs and a few humans, too. What could be responsible for such weird carnage? Could it be . . . chupacabras? 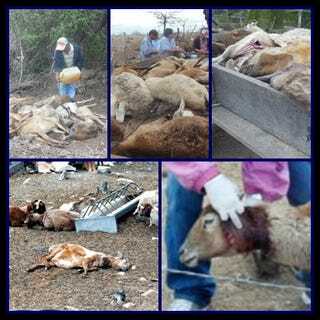 Rumors about the Chupacabras have gained strength as a result of the death of a large number of sheep on a property belonging to a political representative of that province. Yesterday, at 5:00 a.m., when workers arrived at the property, they found dozens of dead sheep with injuries to their necks. Others had bled to death. Nearly 42 animals were lifeless and another 10 injured. The possibility that the death toll would increase over time was not dismissed. Congressman Valentin Suárez, the owner of the farm, reported that the flock’s size was 200. The premises where the sheep pens are located near the Palmerola Air Base. The congressman noted that while he has dogs and watchmen, there was no noise at night that alerted anyone to the presence of strange animals within the property. “This is the first time such a situation has taken place in the area, and not finding a cause worries us, since there are no predators in Comayagua valley,” said Suárez. A veterinarian ruled out attacks with a weapon — apparently the sheep were attacked by some kind of animal. Could it be the legendary chupacabra, on the prowl again? Based on what I learned from Syfy's upcoming chupacabra movie-of-the-week (Chupacabra vs. the Alamo — no I am no kidding), I can say this is definitely a realistic possibility. What I learned from Erik Estrada in that movie is that chupacabras may not be very big, but they hunt in packs. And they can jump really fast. So yeah, I'm pretty sure these sheep were mutilated by the famous American cryptids.